Alan Moore signing, originally uploaded by alister. 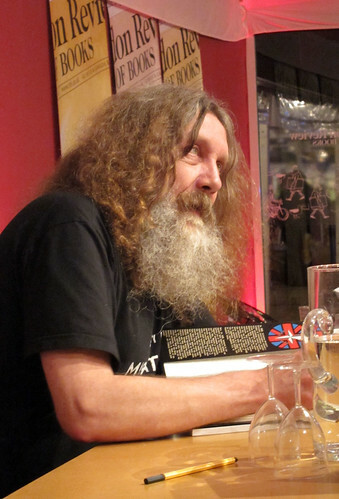 Last week saw the appearance at the Edinburgh Book Festival of the arch-mage and Lord Protector of Northampton himself, Mr Alan Moore. The last time I 'met' Mr Moore was in about 1985 at the late lamented Science Fiction Bookshop in West Cross Causeway, around the time of Warrior for which Mr Moore contributed V for Vendetta and Marvelman amongst others. Alan was his usual darkly fascinating self, but was quite charming to all those who queued for up to an hour to get book signed, his stories kept the queue amused as well.